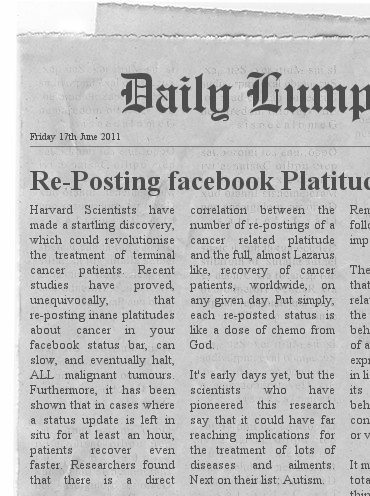 dust free keyboard: facebook cures cancer! Hurrah! It is magic Jon; the work of angels no less. The status update bar holds the fate of the world within it, but yes, it's too late for our dear departed Pat. However, I feel sure that re-postings requesting the return of prodigal son Dennis Tanner to the safe bosom of Rita in the Kabin, HAVE been heard and acted upon by the wizards of facebook. I never give up hope though, so I am posting a status update requesting a time machine that will take me back to 1978 where I will re-train Gene Hunt in the art of surgery and oncology, knowing what we now know, and maybe, just maybe, Pat will be saved.